Friday nights we usually meet in the pub after work. Therefore, evening meals on a Friday usually fall into categories of being quick, easy, tasty, and none too healthy. 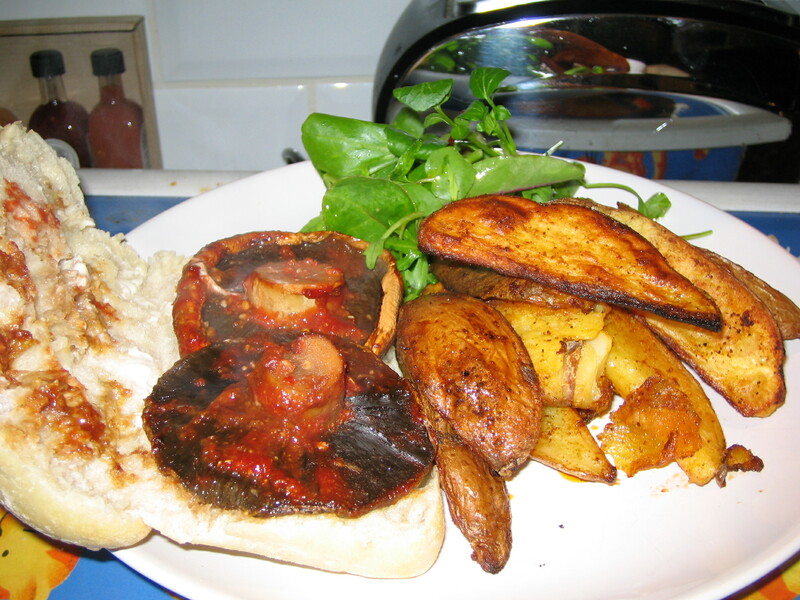 Smoked mushrooms and potato wedges regularly fit the Friday bill. I bought my food smoker about a year ago, on the advice of random_kitty, someone I’ve never met who posts on the BBC Food message boards. My smoker is a Cameron’s brand, and I love it very much. I usually use it for smoking my own tofu, but it also works well with chillis, potatoes, aubergines – and especially these mushrooms. I smoked the mushrooms for about 10 minutes using hickory woodchips. I brushed the mushrooms with the marinade and baked in the oven for about 10 minutes until the mushrooms were cooked through. I served 2 per person on ciabatta bread with potato wedges and some salad. Hey Liz! I’m glad you started blogging. And BTW, I don’t mind the football references at all.